For four days, Optimist Club members from the PNWD gathered with Other Optimist Clubs from around the world at the 93rd Annual Optimist International Convention. They shared fellowship, traded ideas, participated in training and planned for the future by voting on amendments to the bylaws and electing international officers for 2012-2013. 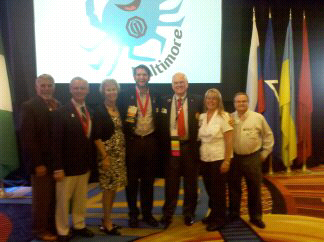 Joining the International Board of Directors are Michael Goldman of Florida and Paul Lucas of Texas. Linda "Mo" Molthen of the PSED was appointed vice president and J. C. St. Onge was elected as president. Amendments to the bylaws were adopted to make self nominations more inclusive and the financial issues for pension trustees and district reporting were passed; however, the Childhood Cancer Campaign and suggestion to change the Optimist Creed failed. A resolution to create program called the Childhood Wellness Campaign passed. Eighteen Fourteen members from British Columbia, Washington, Oregon and Idaho enjoyed the convention. Unfortunately most got away before this picture was snapped.